Personally, I have never had to remove cholla needles from myself or anyone else (knocking on wood) and I hope you never have to either. But, as a precaution I think it’s important to know what to do, in case you accidentally get stuck. Literally. Getting pricked by a Teddy Bear Cholla, means that the entire circular pod will come along with the needles making this extremely difficult and painful to remove. Your best bet is to get a stick or tool of some kind to pluck the pod(s) out. The needles have microscopic thorns that act like a barbwire in your body, so pulling them out is going to hurt. Do not touch your face or put the injured area into your mouth. The cactus needles can easily transfer, so putting it near or face and/or mouth will only make the problem worse. Carry a plastic hair comb or a multi tool in your pack. 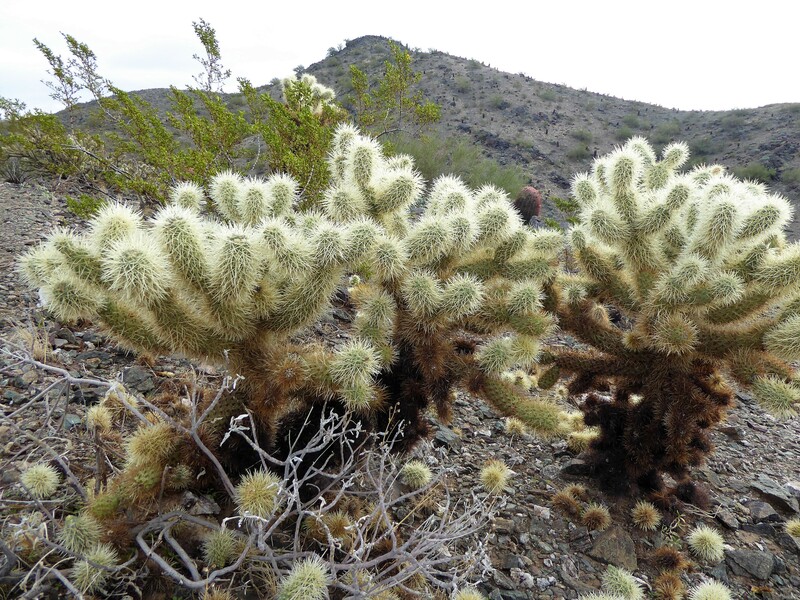 It’s been said that if you get stuck with a cholla, you can use the comb to go underneath and pluck it out of your skin. Just make sure your aiming the cholla pod away from everyone else around. Use tweezers to remove the left over needles. They will likely be small and hard to see so make sure you get to good lighting to see better. Place duct tape over the area and then quickly pull it off like a band aid. This will hopefully remove the needles, and not your skin! Use gauze and white glue. Wrap the area up in gauze and then soak it in white glue. Once the glue dries, peel off the gauze which should take the needles with it. Hopefully you don’t find yourself ever in this situation, but I would carry a comb with you just in case! Here’s a fun video of this poor guy getting stuck and removing teddy bear cholla needles. It looks painful but at least they have a good attitude about it! Hot dog tongs work well to remove the cholla ball. Those are awful and can be painful. I had several encounters with Jumping Cholla. Ouch!